Do I hear shouts of "CHIO!!!!"??? See how wet the track was? And all the sharp turns? Where only females rule the track, eh? And eh, you saw the name??? 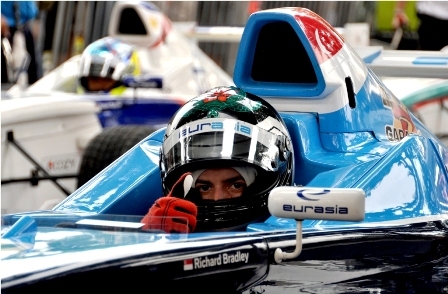 Richard Bradley will be there to give lesson leh!!!!!! Wee-woo-weet!!!!! I HAD to post up such a shot, because pretty people have plenty of tak-glam angles too. I would know, right? Yes, plenty of strangers, judging from the number of girls on their mobiles. Thank god for the invention of the phones which we can tweet, facebook, play games, read news, etc with...*fiddles fiddles*, else what would we do in awkward situations like these? If you don't know who Cheryl is, you got eyes no see orh-yee-orh~ Go take last Sunday's copy of Sunday Times, the MM Lee one, and look for the MyLifestyle DRIVE section. Quite a few articles are written by her. 9tro magazine? She writes for them too. And Wheels Asia. And several other motor publications. "Cheryl Tay is Singapore’s only female full-time motoring journalist and motorsports blogger, with regular contributions to prominent titles in Singapore, Asia and internationally, having interviewed several Formula 1 drivers such as 2010 World Champion Sebastian Vettel and other key motorsports personalities including Red Bull Racing's Christian Horner and Adrian Newey." I didn't know nuts about what flags meant what, but now I do. The odd-looking Japanese-flaglike-but-off-colour flag means your car is going to either peng san or blow up on you. Recognise this flag, AT ALL COST! Anybody noticed my helmet not? 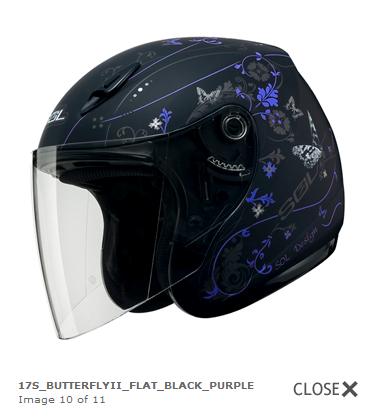 Black with purple butterflies~~~ Chio right? Comes with 8 vents for maximum ventilation (I actually felt the wind through my head at the crown wearing this one than my other few old helmets...) And the good news? You ready for this??? I'M BRINGING THESE HELMETS IN!!!!! Well, I was told it might be wet on the track, so I went and put on my motorcycle raincoat. And I had my own riding gloves so I didn't have to wear someone else's. I cannot stand wearing anyone else's gloves/socks/shoes/helmet or stuff which you know comes into close contact with this yucky thing known as sweat. Or perspiration. Or body waste and toxins. So even during training, I wear my own helmet/gloves. I used to ice-skate, and I ALWAYS wore my own skates. I think the only time I wore someone else's shoes was when I went bowling. And I really didn't like that. I didn't like bowling enough to go get my own bowlers' shoes. Am I glad I had my raincoat on! The other girls were all sooty and dirty from dirt wheeled up from the track! And we're off to the race! FAIL!!!!! 3rd from last~ Lousy TTM. Bye I go stick my head in the sand and suffocate to death now. It was really quite an experience...having no guys on the tracks at all to race with you or judge you or tackle your kart...and an all-girls' race can be quite exhilirating too...you know how girls can be more competitive than guys right? The sharp corners and drifting (which I will probably NEVER try on a real car), plus the wet floors, make for such exhilirating excitement. My arms ached for the next 3 days...so I gues it's good training for the bye-bye arms too.